What Does Improvement Science Look Like In Real Classrooms? Monique Maynard has been teaching for 17 years and prides herself on creating a dynamic classroom culture where students work together in groups. She teaches at West Warwick High School in Rhode Island. When she taught precalculus she spent very little time at the front of the room, preferring to give students tasks to work on together and then circulating to listen and help. But when her principal asked her to switch to teaching freshmen algebra three years ago, it was “a culture shock.” Within the first week of teaching freshmen, she had scrapped the groups and had all the students in rows. “I morphed into one of those teachers at the front of the room, one of those teachers I swore I’d never be,” Maynard said. Her young students just weren’t mature enough to handle group work at the start of their high school career, and in her confusion Maynard reverted back to what seemed easiest -- control and conformity. When Maynard joined the Better Math Teaching Network (BMTN), she found the support she needed to go back to what she knew was best for her students. The BMTN is a community of researchers, teachers and instructional leaders in New England working together to make algebra teaching more student-centered. In this case, student-centered means “students are actively and deeply engaged in understanding the content.” The network grew out of research into the student-centered math teaching strategies that work best, funded by the Nellie Mae Foundation and conducted by the American Institutes for Research (AIR). Teachers in the BMTN choose to focus on deepening their students’ abilities in one of three areas: connect, justify and solve. They are grouped with other algebra teachers at schools across New England working on the same skill. They each test small changes in their classrooms, iterate on those changes, and bring their findings to monthly conference calls where they get ideas, feedback, coaching and encouragement. 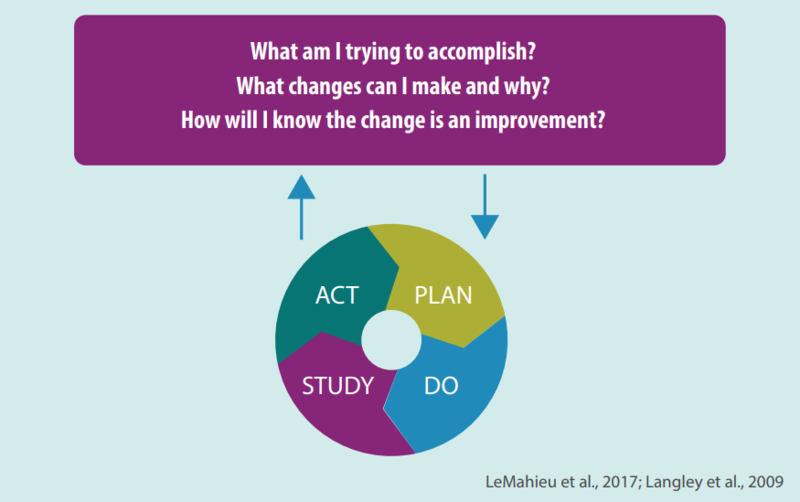 Improvement science is an approach to incremental and sustained change championed by the Carnegie Foundation. It’s grabbing the attention and excitement of many in the education community, including the Bill & Melinda Gates Foundation, which announced it would fund more networked improvement projects across the country. Improvement science is based on the idea that practitioners -- in this case teachers -- are best positioned to test new ideas and know what works and what doesn’t. Teachers engage in rapid cycles of developing a change idea, testing it, collecting data on it, and reflecting on whether it achieved the stated goal or should be altered. When many teachers are engaged in these PDSA cycles and sharing their findings, good ideas surface to the top and get incorporated into other classrooms. Walters and his colleagues understand that teaching math in a way that pushes students to deeply understand concepts is hard work. They hope to hone in on the instructional moves teachers can make in classrooms that strengthen students’ ability to connect mathematical concepts to each other and the real world; to justify their mathematical thinking and communicate it to others; and to solve challenging math problems that go beyond rote algorithms. They are excited about improvement science because the changes come from teachers experimenting with strategies in real classrooms, not from a top-down programs or research studies conducted under ideal circumstances. BMTN is now in its fourth year and has steadily added teachers, although it is by no means large. 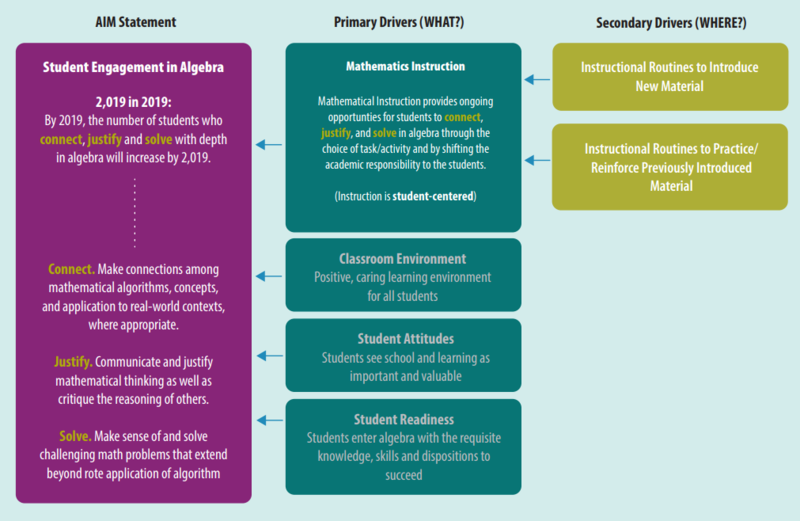 Scaling up a project like this is hard because of the time and resources required, but Walters thinks principals at the building level or instructional coaches at the district level could use improvement science to improve instruction. One key, however, is voluntary participation from teachers; they have to want to do this work for it to be successful. Another, is to keep the focus narrow. The BMTN focuses on algebra teachers because algebra is a gateway course to higher mathematics, opening doors into other science, technology, engineering and math (STEM) fields where much of the new job growth has been. Many students currently aren’t learning math deeply enough to excel when they get to more challenging mathematics, creating a pipeline problem to well paid careers in those fields. When BMTN teachers meet virtually they talk through each participants change idea, the data they’d collected on how it impacted students’ engagement, and how they plan to proceed. Walters and his colleague Toni Smith, a principal researcher at AIR, acted as coaches to these groups. It was their job to ask probing questions, keep the conversations focused on the specific area of interest, and sometimes to offer advice. “We as coaches try to focus the conversation to be about looking specifically at the data and what it’s helping us see,” Smith said. 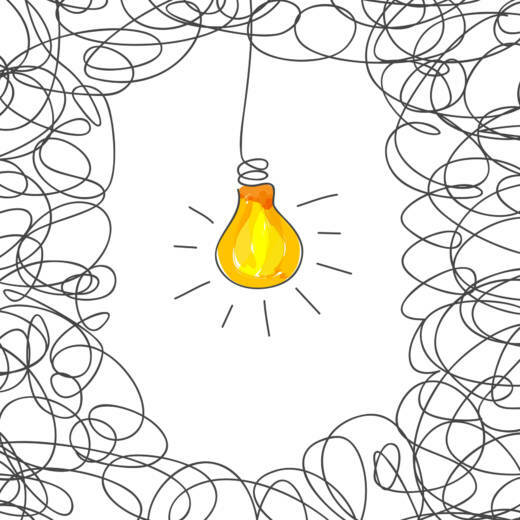 Before implementing an idea, teachers predict how it will change students’ ability to connect, justify or solve with depth. When they bring their data to the group they’re looking to see how it either supports their prediction or contradicts it. In either case, there’s a lot to be learned about what to try next. As coaches, Smith and Walters learned a lot through this process. They’ve learned to balance honoring the work teachers have done with pushing for more depth, and most crucially, they’ve learned that coaching is most effective as structured feedback on a narrow set of practices. “That’s the way to get something moving; it’s not this broad stuff,” Walters said. At West Warwick High School, Monique Maynard chose to focus on helping students justify their mathematical thinking. She spent the first several months trying strategies to get students to write structured justifications: a stated claim supported by three reasons that point back to their work, capped off with one sentence repeating the claim. She even worked with an English teacher to try to align this structure to what they were learning about making claims and supporting them with evidence in their writing. Maynard spent two Plan, Do, Study, Act (PDSA) cycles trying to get students to justify their thinking in the structured way she had envisioned. But she was frustrated when nothing she tried worked. Eventually she turned to her students for advice, asking them where they were struggling. When she got together with other teachers in the network they took a hard look at the rubrics they were using and decided that it might be more productive to focus on getting students to analyze using reasoning. She also took a suggestion from Walters, her coach, that she try offering students models of the kind of analysis, reasoning and justification she was looking for to help them understand what she wanted. That led her to give groups example problems where the analysis and reasoning had been done. She gave them time to highlight and take notes on the problem, to discuss with their group, and to come back together as a class to discuss. Only then did she give them a new, but similar task and ask them to apply the kind of analysis they’d seen in the example. Maynard admits this process is slow at first, especially on the first day. Students would often finish the independent tasks for homework. But the next day they could do it much more quickly, and more importantly she saw improvement in how deeply they were analyzing the problem, providing reasoning, and using multiple representations to justify their answers. “I covered more material with this algebra one class than I have in the last four years and with greater depth,” Maynard said. For their final exam, students had to solve a systems of equation task, a problem more commonly found in Algebra 2. “I found out that even really small differences in classroom routines can create really powerful differences in classroom dynamics and student learning,” Maynard said. Perhaps more importantly, she said all her kids were engaged in every class, even suggesting tweaks to the routines for next year. She has worked with other educators at the state level to develop statewide math competencies, evaluated assessment questions, participated in lesson study, and done other district professional development. She says none of that has made as much of an impact on her teaching as participating in BMTN. Heather Vonada teaches Algebra 1 and 2 at Woodstock High School in Vermont. Entering her 15th year of teaching, she applied to be part of the Better Math Teaching Network because she thought it was time for something new. She’d had a realization about herself. She realized that even though students liked her class and her, she was the one asking all the questions, doing all the discovering. If she wanted to make her class more student-centered she needed to flip that dynamic. She could see that her students were following procedures without doing much thinking. And, on top of that, she was getting bored teaching this way. She’s now entering her third year with BMTN. “It’s nice to have a group of people who are working together for the common goal. And the goal is not awfully lofty,” Vonada said. She likes that she can focus in small changes to her teaching practice -- it feels manageable, even with the many daily tasks and demands on her time. In her first year, Vonada focused on helping students make connections between mathematical concepts and procedures. She thought the work she was doing in another professional learning community around math talks could translate, so she focused on structured math talks to elicit connections. In her second year, she worked on justifications, and plans to focus on solving this year. Working with the network, getting feedback from the AIR coaches, and intently focusing on her own particular problems of practice has dramatically changed how Vonada teaches. She no longer stands at the front of the room talking at students. Now she’s more often found at the back of the room, listening to students interact, secure in the knowledge that structures she’s implemented have students working and thinking hard. Like Monique Maynard, Vonada found that once she got used to the tools of improvement science they became second nature. She said other teachers in her building have even engaged in similar kinds of inquiry, so using this method at the building or district level wouldn’t be impossible. The key thing is that teachers are at the center of this process, determining what to work on, strategies to try, tweaks to be made, when to drop a strategy, and when to elevate it to the broader network. In the process, Vonada has come to see herself as a leader in the field. “I now have the courage to present at conferences,” she said. “It’s given me a feeling that I can be a resource for other teachers."